Oklahoma Connection | David came to live in Chouteau, Oklahoma, in 1917. Susan B. Anthony, the famous American Civil Rights leader who advocated for equal rights between the sexes, was a close friend of Alice David and is the one who urged Alice to “carry on the work of women’s suffrage.” In her writings, Mrs. David listed her “hobby” as prohibition. Alice David was born in Missouri and “took the stump” for suffrage and prohibition in Kansas in the 1870s where she became the publisher and editor of the paper of the Woman’s Suffrage Association of Kansas and was a popular speaker and writer attending rallies around the state. 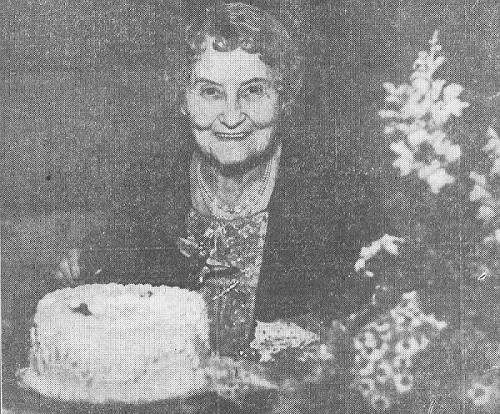 Mrs. David came to Chouteau, Oklahoma in 1917 to live with relatives after her husband died, but the “newly gained power of women in politics” drew her to Oklahoma City in 1920, where she continued her efforts in boldly proclaiming equal rights for women and the prohibition of liquor across the state. She joined the Women’s Christian Temperance Union (WCTU) in 1889, served as its vice president from 1920-1923, and was elected as the head of the state’s WCTU for 13 consecutive years. See pictures of Alice David and other media HERE.